Recently I entered a fitness challenge with my coworkers to walk the highest amount of steps per day. Our team members were given pedometers to wear during an 8-week period in which steps were to be counted. The baseline for fitness and health is 10,000 steps per day or approximately 5 miles (8K). Since most people work in sedentary desk jobs how feasible is it to log at least 10,000 steps per day or more without going to too much effort? In order to win the fitness challenge we would have to go the extra mile to win. Lets take a look at the facts. Our hunter gatherer ancestors walked approximately 20 miles (33K), yes 20 miles (33K), foraging for food and performing basic survival techniques every day. They were a strong, hearty and muscular people with fitness levels modern Olympians struggle to attain. With the birth of modern technology and the conveniences of today it has become a challenge to log a quarter of what our genes were designed for us to do. How do we overcome this hurtle within the constraints of time? Let’s use technology to our advantage. Grab a pedometer and let’s go! Why is it important to walk approximately 5 miles (8K) per day to maintain fitness and where did this arbitrary number come from? 10,000 steps per day is equivalent to approximately 30 minutes of aerobic activity, recommended by most physicians for individuals to maintain a healthy weight and lower blood pressure. You don’t have to workout for 30 minutes per day to attain a decent level of fitness if you are making it your personal goal to log at least 10,000 steps per day. Steps can accumulate throughout the day by doing the following : walking over to a coworker rather than sending an e-mail, printing something from a printer that is further away, making sure to get up and walk at least once per hour, walking to the kitchen to refill your water, parking further from your usual spot, getting off one or two stations earlier if you take public transit, cleaning your house, taking a Zumba class or even window shopping! Exercise doesn’t have to be boring or regimented. As long as you make sure to keep a steady stride where you get your heart rate up you can be creative about it. 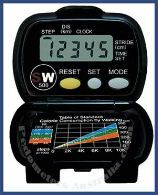 If you have the right pedometer then you are set to go. Most decent pedometers will cost approximately $20-50. I use the SW500. It works quite well as I have tested my steps and stride length and it is pretty much on point. Another good one is the SW200, available on Amazon.com. Pedometers measure the amount of steps you take by recording the movement of your hip bones. That is why it is important to wear a pedometer near your waist to record the most accurate amount of steps. Be sure to test your stride length to ensure your steps are recorded correctly. People with longer legs will have longer stride lengths. Pedometers can also be a huge motivation for individuals. Studies have shown that individuals using a pedometer take an average of 2,500 more steps per day than their non pedometer wearing counterparts. Here’s a chart of the amount of steps per day that the average people take and what it means for their fitness levels. Check out the below source for more information. Instead of fretting over whether you are taking the right amount of steps I recommend wearing a pedometer to see for yourself. Not only will it give you a baseline for your regular activity level but it will also motivate you to walk that extra mile. Who knows? It may even save your life! Missed a Nutritiongal newsletter? Find them all on My Nutritiongal blog. Hello and welcome to Volume 5 of Nutritiongal’s Newsletter and we’re here to PUMP YOU UP! Swimsuit season may be coming to an end for many of you who don’t reside in the tropics but that’s no excuse to put away the sneakers and gym shorts. You don’t need any fancy equipment, a lot of time or even a gym membership to be in tip top shape. All you need is a little sweat and a routine you enjoy! Have you ever heard of the exercise energy paradox? You want to exercise to have more energy but you can’t exercise because you have no energy. Well now it’s time to jump over that hurdle. Exercise is like the momentum of a swinging pendulum – you know… like the one in physics class? Once you get going with a routine, it can easily be incorporated into your daily schedule and you keep going and going. If anyone tells you “No pain, no gain.”, tell them to take their time machine back to the 80’s. Exercise doesn’t have to be unpleasant or take up a great deal of time – unless you’re going for an Olympic medal or are a professional athlete of course!!! So why exercise? Can’t you eat right and be healthy without breaking a sweat? Who wants to have messy hair and add more dirty clothes to the laundry pile? What about people who are thin and don’t exercise? Are they really as healthy as they look? 1. Going back to the origin of our modern human species, the homosapian, approx 200 thousand years ago, our ancestors walked 20 miles per day on average in search of food and shelter. We developed the fight or flight response (stress response), in which the hormone, cortisol, was released, causing the body to react quickly to environmental stresses. Ergo, when earlier homosapians were hunting for food (stress), cortisol enabled them to act quickly to seize their prey or run away if they were another species’ dinner. Fast forward to present day and you have a similar physiological stress response to work, bills and traffic, to name a few, but no physical activity. The average American walks approx 1 mile per day or less. That’s a far cry from 20 miles! Its no wonder we are plagued by heart disease, diabetes and obesity. Throw exercise into the mix and you have your basic paleolithic remedy to the diseases we are now combating. 2. Exercise stimulates the lymphatic system, increasing your immunity. It also increases body temperature temporarily to help fight infections and increases blood flow throughout the body. 3. Exercise also results in a more aesthetically pleasing physique. Check out all the “HOT” benefits of working your body in different ways. Think you can’t muster up the the energy to do CARDIO or hate exercising? Consider some alternative forms of cardiovascular exercise and the average number of calories burned. Check out this extensive chart on calories burned per hour based on activity type and weight. Break the exercise energy paradox barrier today! Check out Joel Harper’s excuse busting, no gym equipment workout and break a sweat in under 20 min!!! Take the exercise challenge today! All you need is a little motivation and you can be fit in as short as 20-40 min 3-4 times per week. Don’t let limitations define you. Find the exercise that works for your body and reap the benefits! Visit http://www.nutritiongal.com and fill out a health questionnaire for a free consultation today!